African efforts to denuclearise Africa originated in the 1960s in response to French nuclear tests in the Sahara Desert and to apartheid South Africa's nuclear weapons programme. The Organisation of African Unity joined the UN in the mid-1960s to denuclearise the continent. With international opposition to its apartheid policies, the South African government became increasingly isolated; a situation which worsened as confirmation of the country's nuclear capabilities revealed the extent of its nuclear weapons programme. By the end of the 1980s, the apartheid government under President F.W de Klerk decided to terminate the South African nuclear weapons programme as well as its apartheid policies; a decision which accelerated the denuclearisation of Africa. Once South Africa's commitment to nuclear non-proliferation became evident, the continent included it in negotiations on an African Nuclear Weapons Free Zone Treaty (Pelindaba Treaty). With the treaty's entry into force in July 2009 and South Africa's subsequent election to leadership positions in the treaty's compliance mechanism, South Africa's nuclear diplomacy with Africa entered a new phase which continues to pose challenges to the continent's commitment to nuclear non-proliferation. Keywords: Africa; African Union; diplomacy; nuclear weapon free zone; Organisation of African Unity; South Africa; Pelindaba Treaty. Pogings om Afrika van kernwapens te vrywaar het hul oorsprong in die sestiger jare as 'n reaksie teen Frankryk se kern toetse in die Saharawoestyn en apartheid Suid-Afrika se kernwapen program. Die Organisasie vir Afrika-eenheid het in die middel sestigerjare by die Verenigde Nasies aangesluit om kernwapens uit Afrika te verwyder. Internasionale teenkanting teen apartheid het daartoe gelei dat die Suid-Afrikaanse regering toenemend gei'soleer is. Hierdie toestand is vererger namate die omvang van die land se kernwapen program bekend geword het. Teen die einde van die tagtiger jare het die apartheids regering onder leiding van President F.W. de Klerk besluit om die Suid-Afrkaanse kernwapen program te staak en om apartheid af te skaf. Hierdie besluite het die kernontwapening van Afrika versnel. Namate Suid-Afrika se toewyding tot kernontwapening duideliker geword het, is die land by onderhandelinge oor 'n verdrag oor 'n kernwapenvryesone in Afrika betrek. Die verdrag het in Julie 2009 in werking getree met Suid-Afrka as verkose leier van die verdrag se nakomings meganisme. Hiermee het die land se kern diplomasie 'n nuwe fase betree. Hierdie fase bide nuwe uitdagings vir kern nie-proliferasie op die kontinent. Sleutelwoorde: Afrika; Afrika-unie; diplomasie; kernwapenvryesone; Organisasie vir Afrika-eenheid; Suid-Afrika; Pelindaba-verdrag. In May 1944, a meeting took place between South Africa's prime minister, General Jan Smuts, and the Danish nuclear scientist, Niels Bohr; a meeting which has been described as the "genesis of South Africa's atomic energy policy".1 The government of the United Kingdom (UK) requested Smuts in 1945 to conduct a secret survey of South Africa's uranium reserves to supplement geological reports on radio-active materials in South Africa released between 1915 and 1923.2 Towards the end of the 1940s, a uranium processing pilot project began operation in South Africa. The country's uranium production increased significantly with its exploration and extraction of uranium in South West Africa (SWA, now Namibia), which South Africa at the time administered as a League of Nations C-class Mandate. In 1957, South Africa's nuclear science and nuclear diplomacy took off under the aegis of the United Nations (UN) nuclear agency, the International Atomic Energy Agency's (IAEA) Atoms for Peace programme. By 1965, Prime Minister Hendrik Verwoerd inaugurated South Africa's first nuclear reactor, the South African Fundamental Atomic Research Installation (SAFARI-1). Subsequently, South Africa's nuclear programme progressed rapidly with the development of at least six atomic devices by 1989. As the international isolation of apartheid South Africa increased, its mining operations in SWA were repeatedly criticised for the "illegal acquisition of Namibian uranium".3 Apart from Belgium's uranium exploration in the Belgian Congo (now the Democratic Republic of the Congo, DRC), France also commenced uranium exploration in Africa and its early operations in Gabon, Niger and the Central African Republic (CAR) continue to this day. As France's nuclear energy and weapons programme developed, the country's uranium exploration in Africa correspondingly increased. Established in 1963, the Organisation of African Unity (OAU) became one of the most vocal opponents of apartheid South Africa by adopting a series of resolutions and declarations against the country.6 After initial attempts to denuclearise Africa, the diplomatic process lost momentum with the entry into force of the Treaty of the Non-Proliferation of Nuclear Weapons (NPT) in 1970. Further impending factors were the nuclear ambitions of some African states, as well as South Africa's nuclear weapons programme. The establishment of nuclear weapon free zones (NWFZs) has been one of the most significant post-1945 multilateral efforts to prevent nuclear proliferation. On 2 October 1957, in the early days of the Cold War in Europe, Poland - fearing West Germany's emergence as a nuclear power and the Soviet Union's troop deployment on its territory - submitted the so-called Rapacki Plan (after Poland's foreign minister, Adam Rapacki) to the United Nations' General Assembly (UNGA). The Plan called for a NWFZ in Central Europe, comprising Poland, Czechoslovakia and the Federal Republic of Germany, to prevent nuclear proliferation in the region. As the Cold War intensified, the Rapacki Plan had little chance of implementation. However, the idea of NWFZs as instruments of the norm of nuclear non-proliferation did not disappear. 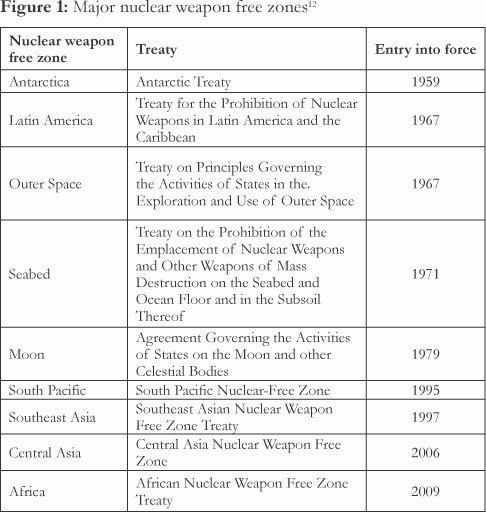 On the contrary, barely two years after the Rapacki Plan, the Antarctic Treaty of 1959 became the first expression of the norm of nuclear proliferation in the form of a NWFZ.8 The Cold War delayed the further establishment of NWFZs. However, in 1967 the Treaty of Tlatelolco, declaring Latin America a NWFZ, entered into force. The NWFZ regime was further entrenched in 1975 when the UNGA adopted several guidelines that states should follow when establishing a NWFZ.13 In May 1978, the UNGA again re-iterated the importance of NWFZs as a "disarmament measure".14 However, from the time when the UN first addressed the question of NWFZs in 1974, it took five years for the establishment of the next NWFZ, namely the Moon Agreement. It was when the Cold War ended that more NWFZs were established with the Treaty of Rarotonga proclaiming the first post-Cold War NWFZ in the South Pacific. One possible explanation for this is that the United States (US) and the Soviet Union, as Cold War superpowers, prevented these developments because both stationed their nuclear weapons in several locations outside their national territories. Therefore, the presence of their nuclear weapons in a particular zone was counterfactual to the idea of a nuclear weapons free area. The origins of the Pelindaba Treaty reside in the preoccupation of African states with nuclear energy since the dawn of the nuclear era. As a major repository of uranium, Africa gained strategic importance to emerging nuclear powers with the discovery of uranium in the former Belgian Congo (the current DRC). Like the Belgian Congo, South Africa's entrance into the nuclear era was also an outcome of its abundant uranium resources. These developments further delayed negotiations for a denuclearised Africa. Cold War realities and the nuclear ambitions of certain African states contributed to the delay of the establishment of an ANWFZ. A further impediment was South Africa's unwillingness to join continental nuclear non-proliferation efforts. This serves as a further illustration of South Africa's non-compliance (as a founder member of the IAEA) with the nuclear non-proliferation norms espoused by the Statute of the IAEA. Moreover, South Africa refused to accede to the NPT. The end of the Cold War; the new political era in South Africa; the legacy of the country's nuclear past; and President de Klerk's 1993 announcement that the country had produced six nuclear devices, had several diplomatic consequences. The country returned to the fold of the international community; it acceded to the NPT in 1991; and it dismantled its nuclear weapons programme as verified by the IAEA in 1993, thus paving the way for the resumption of negotiations on an international agreement on the denuclearisation of Africa. Within the framework of the 1965 UNGA resolution on a denuclearised Africa, the UN and OAU convened a meeting in Addis Ababa in May 1991, to prepare for the implementation of a treaty on this issue.20 Despite its nuclear expertise, South Africa was not invited to this meeting. The meeting, the first in a series, included participants from the OAU Secretariat; government officials from Nigeria, Zaire (now the DRC), Algeria, Tanzania and Zimbabwe; representatives of the IAEA Secretariat; and observers from current NFWZs. As constitutional negotiations progressed in South Africa, De Klerk repeated his government's commitment to the ANWFZ in parliament in March 1993. It also became clear that the African National Congress (ANC), now growing in political stature and influence as the dawn of democracy drew near, would continue with its historical anti-nuclear stance despite some ANC support for the continuation of a South African nuclear weapons programme.27 As an ANC-led government posed no threat to African security and Nelson Mandela publicly expressed support for an ANWFZ, continental attitudes towards South Africa on nuclear issues began to change. In an early effort to include South Africa in the negotiations, the Programme for the Promotion of Nuclear Non-Proliferation (PPNN), a non-governmental organisation, acted as a broker between African and the South African governments. The PPNN's facilitation included regional meetings promoting nuclear non-proliferation. Amongst others, it scheduled a meeting from 1-4 April 1993 in Harare, Zimbabwe, in collaboration with the University of Zimbabwe. De Klerk's 1993 announcement prompted the PPNN to invite South Africa to this meeting. Waldo Stumpf, the chief executive officer of the Atomic Energy Commission of South Africa (AEC), was invited to address the meeting. In his presentation, Stumpf emphasised South Africa's "determination to be transparent and its acceptance in principle of a NWFZ for the continent".28 He also expressed South Africa's willingness to assist African states with the peaceful uses of nuclear technology. South Africa's inclusion in the negotiations was the result of a combination of factors, including domestic changes and the country's nuclear diplomacy such as its accession to the NPT and the conclusion of a Safeguards Agreement with the IAEA. More importantly, several African efforts were made to include South Africa, notwithstanding the fact that when the OAU resumed its efforts to draft a treaty on the denuclearisation of Africa which coincided with De Klerk's reforms, the OAU's official position was not to engage with the South African government. Therefore calls to include South Africa in the treaty-making process were indicative of a changing continental position on South Africa. The PPNN meeting was immediately followed by another meeting of the negotiating group in Harare from 5-8 April 1993 on the draft text of the treaty. By now the negotiating group consisted of representatives from Mauritius, Egypt, Nigeria, Tanzania, Zimbabwe and Senegal; two representatives of the OAU; and a UN representative. In contrast to the previous inter-governmental meetings which had specifically excluded South Africa, it attended the Harare meeting as an invited observer and was represented by a troika consisting of representatives of the National Party (NP) government, the ANC and the Pan Africanist Congress of Azania (PAC). At the second Harare meeting, the definitions of African NWFZ and territory caused considerable debate, particularly because the definition of the zone would affect the territories of some NWS and a non-African state such as Spain. Three of Spain's territories, namely the Canary Islands and two coastal cities in Morocco, Ceuta and Melilla, fall within the territory specified by the Pelindaba Treaty. Because some issues remained unresolved at the Harare meeting such as a map of the zone and certain functions of the AFCONE, the UNGA proposed a follow-up meeting in 1995 to finalise the drafting of the treaty. In early June 1995, the OAU considered the final draft treaty and recommended that it should be adopted at its session on 23 June 1995. It also endorsed Egypt's proposal to host the treaty's signing ceremony and South Africa's proposal to host the headquarters of AFCONE. These proposals were approved by the OAU and by the UNGA on 6 November 1995. On 11 April 1996, OAU member states signed the Pelindaba Treaty in Cairo, Egypt, and adopted the Cairo Declaration. In this declaration, the OAU recognised the "valuable contribution" of NWFZs to nuclear non-proliferation; and called on all NWS to ratify the Pelindaba Treaty's protocols and to pursue the "complete elimination" of nuclear weapons.37 Despite the initial positive reaction by African states to the Pelindaba Treaty (47 of the 53 OAU members signed it on 11 April 1996) and the adoption of the Cairo Declaration, most states delayed the ratification and depositing of the treaty with the African Union (AU). A decade later, in 2006, the AU Peace and Security Council (AUPSC) expressed concern about the long delay of the entry into force of the Pelindaba Treaty, pointing out that only 20 of the 28 required states had deposited their instruments of ratification with the AU.38 The Pelindaba Treaty entered into force when the required 28th state deposited its ratification of the treaty in July 2009. This formalised the territory covered by the ANWFZ.39 The treaty requires signatory states to undertake to renounce nuclear weapons; prevent the stationing of nuclear explosive devices; prohibit the testing of nuclear explosive devices; declare, dismantle, destruct or convert nuclear explosive devices and facilities for their development; prohibit the dumping and storage of radioactive waste; promote peaceful nuclear uses and verification of these peaceful uses; provide physical protection of nuclear facilities and materials; prohibit armed attacks on nuclear installations; establish AFCONE; and report and exchange information on nuclear activities. Since the idea of an ANWFZ was first mooted, South Africa practically held the African continent at ransom until 1991 when it acceded to the NPT. It was only after the IAEA verified the completion of South Africa's nuclear dismantlement that the country was invited, albeit as an observer at first, to participate in African efforts to establish an ANWFZ. Characterised by a combination of partnership and cooperation as diplomatic strategies, South Africa's post-1990 nuclear diplomacy on the entry into force of the Pelindaba Treaty proved to be a major departure from its pre-1990 strategy of confrontation with Africa. South Africa's diplomacy on the Pelindaba Treaty resulted in several symbolic achievements. The country successfully used its identity as a country that had dismantled its nuclear weapons programme to host the final draft conference in Johannesburg, as well as name the ANWFZ treaty after the country's nuclear headquarters. Both these achievements illustrated post-1990 South Africa's commitment to nuclear non-proliferation and its acceptance on the continent. The Pelindaba Treaty also introduced a new phase in South Africa's diplomacy on the African continent, also considering that the treaty outlines specific obligations regarding the First Conference of State Parties (COP) and the establishment of a mechanism of compliance. Ethiopia, Gabon, The Gambia, Kenya, Lesotho, Libya, Malawi, Mali, Mauritania, Mauritius, Mozambique, Nigeria, Rwanda, Senegal, South Africa, Swaziland, Tanzania, Togo, Tunisia, Zambia and Zimbabwe); AU states not yet party to the Treaty (Egypt, the DRC, Djibouti, Ghana, Namibia, the Sahrawi Arab Democratic Republic, Sudan and Uganda); Parties to Protocols I, II and III of the treaty or those who are expected to become parties to these instruments (China, France, the Russian Federation, Spain and the UK); AFRA; the IAEA; the PrepaCom for the Comprehensive Nuclear-Test-Ban Treaty Organisation (CTBTO); and the UN. the commission's headquarters. South Africa's position on the issue resulted in confrontation with some conference delegates. South Africa received "strong support" from Algeria and most SADC states, with Zimbabwe trying to "avoid endorsement" on a "technicality" to host AFCONE.44 Another diplomatic success was its election as one of the twelve Commissioners of the AFCONE. Abdul Minty became South Africa's commissioner on the AFCONE. Irrespective of these successes, some continental opposition was evident. During the tenure of President Thabo Mbeki, South Africa promoted the idea of an African Renaissance and an African agenda in its foreign policy. This may have strengthened perceptions that South Africa was too ambitious and dominant in continental affairs. By the time the First COP took place, President Jacob Zuma had been in office since May 2009. Like Mbeki, Zuma is also a strong promoter of the African agenda in South Africa's foreign policy. The establishment of AFCONE did not mean that the commission was operational. In order to achieve this, a First Ordinary Session of AFCONE was scheduled for May 2011. For South Africa, the First Session also produced some diplomatic successes. Both the hosting of the AFCONE's headquarters and Minty's chairmanship advanced its national interests and strengthened its identity as a responsible and committed supporter of nuclear non-proliferation. But in addition, undercurrents were increasing over South African dominance in atomic development and its political role on the continent. It was felt that this might pose a threat to the implementation of AFCONE. When the treaty opened in 1996, it was intended that AFCONE would "supervise" the treaty's implementation.47 However, other African states including Egypt, Kenya, Namibia and Nigeria are increasingly vying for prestige and leadership in Africa's nuclear sector. This appears to be a spin-off of the extent to which the IAEA has become integrated with African states in various and an increasing number of collaborative projects that have escalated over the past 20 years. Despite the decision at AFCONE's First Session to meet again in July 2011, no record of this meeting or its cancellation could be found. Instead, on 8 July 2011, an AU statement again urged remaining African states as well as protocol countries, to ratify the treaty without delay. The AU also called on its members to provide AFCONE with the necessary support.49 Consequently, indications are that AFCONE already lacks sufficient backing, not only for reasons stated by the AU, but also due to political tensions among its members and the different agendas of its members. The nature of contentious issues that were raised between its member states remains undisclosed. Additionally, the issue of AFCONE's funding remains unclear. Overall, the prognosis for a fully operational AFCONE is debatable and not positive. The First Ordinary Session of AFCONE did not address all the outstanding matters pertaining to its operation. The election of Minty as AFCONE chairperson, however, points to some success of South Africa's nuclear diplomacy. Similar to his election to other leadership positions, Minty yet again enhanced the country's status and prestige, and with the hosting of the headquarters of AFCONE, will bring some material benefit for the country. South Africa's diplomacy with its African counterparts is conducted against the background of its post-1994 foreign policy, which places Africa high on the agenda. This Africanist turn has accelerated the country's integration in continental affairs and decision-making. Moreover, South Africa - especially during the presidency of Thabo Mbeki - has positioned itself as the "voice" of Africa and the global South.50 This section assesses aspects of South Africa's diplomacy in terms of its African agenda; its niche diplomacy in Africa; its state identity and power on nuclear issues in Africa; and the performative aspects of its diplomacy in Africa. South African foreign policy has displayed some characteristics of transformational diplomacy that signifies a return to the use of the traditional instruments of diplomacy, partnership and the idea that norms matter more than material power.51 South Africa's diplomatic relations with other African countries on nuclear issues show all the signs of transformational diplomacy. In Africa, South Africa's nuclear diplomacy is aimed at undoing the legacies of its nuclear weapons programme and at convincing Africa that the country remains committed to nuclear non-proliferation. South Africa also attempted to undo existing global nuclear-related power structures by working towards a denuclearised African continent. In addition to this, South Africa's state identity as a domestic reformer proved to be useful in a diplomatic sense by advocating African and global nuclear-related reforms. Thus, the country achieved some of the objectives of its African agenda. South Africa has some advantage over other African countries due to its nuclear past. This advantage includes locational, traditional and consensual elements.52 It has been locational to the extent that South Africa is the only African state to have acquired and given up nuclear weapons. Moreover, the country maintains a globally-competitive nuclear science capability. The traditional advantage of South Africa is that the country has a nuclear history, while its consensual advantage is that its non-proliferation commitment is reflective of post-apartheid commitments. South Africa's ability to "generate return worth having", implies that it wants to achieve non-material objectives with its niche diplomacy in Africa.53 This generated African prestige, status, material benefit, soft power and moral authority. With the dismantling of its nuclear weapons programme, South Africa has accrued unprecedented moral authority and legitimacy for a former nuclear weapons state. These non-material incentives are of particular importance to convince the rest of Africa of its commitment to continue with a non-weapons nuclear programme. An actor's conduct and practice of nuclear diplomacy is an expression of its identity and its interests. Therefore, the main purpose of South Africa's nuclear diplomacy in Africa has been to achieve objectives aligned with its construction of its national interests, its identity and the nuclear-related norms it complies with. South Africa has attempted to construct a new identity, with the "Other" being its apartheid past, rather than other international actors.54 In this sense, South Africa has managed to construct a nuclear identity in Africa through positive approximation, that is by associating with the positive nuclear norms and identities of other African states. This nuclear identity has also been achieved through negative approximation, namely by distancing itself from its historical nuclear posture. South Africa's improved status can be ascribed to several factors, including its soft power and influence. Its departure from "power as resources" to "relational power" reiterates the social rather than the material construction of power. Accordingly, several dimensions of power can be applied to South Africa's nuclear diplomacy with the rest of Africa. In terms of the scope of its power, South Africa's power varied from one issue to another within the context of the Pelindaba Treaty. Although South Africa had little influence in the initial establishment of AFCONE it wielded considerable influence by re-asserting its role as the host of AFCONE. In terms of the number of actors under its influence, South Africa attempted to re-direct the focus of the Pelindaba Treaty and AFCONE away from nuclear safety and security - which it regards as imperative - to the peaceful uses of nuclear energy to contribute to the continent's development. This emanated from the country's broader African agenda and its role in the establishment of the New Partnership for Africa's Development (NEPAD) at the time of the negotiation of the Pelindaba Treaty. In terms of the weight of its power, South Africa succeeded in naming the treaty after a South African installation; to lead and AFCONE; and to exercise its power and influence through diplomacy. The implications of South Africa's nuclear diplomacy in Africa have been wide-ranging. Not only did it contribute to entry into force of the Pelindaba Treaty but also to enhancing the country's status and prestige. South Africa, which no longer has power in the form of nuclear weapons, continues to wield considerable soft or normative power on the continent. Moreover, as the leading country in AFCONE, South Africa assumes the responsibility of leading the continent in applying and enforcing norms on the development and application of nuclear energy for peaceful purposes. South Africa is officially represented at bi- and/or multilateral conferences, meetings and negotiations on nuclear-related issues. Engaging predominantly in multilateral diplomacy in Africa, South Africa initially employed non-governmental representatives such as Waldo Stumpf and representatives of the chief negotiating political parties and liberation movements.55 As South Africa's influence, identity and status as a state committed to a denuclearised Africa improved, the status of its diplomatic representation and representatives also changed from observer to official diplomatic representatives. This included having career diplomats at negotiations and institutions such as AFCONE. South Africa established additional relations with African states through its membership of AFRA and the signing of bilateral agreements on nuclear energy with France, the US and the UK. The country has initiated and supported ideas on the use of nuclear technology. Closely related to this performative aspect is the inter-subjective understanding of the "nuclear taboo" (the non-use of nuclear weapons) and the peaceful uses of nuclear power. At the First COP of the Pelindaba Treaty, South Africa emphasised the importance and utility of the peaceful uses of nuclear energy for Africa's development. South Africa also engages in socialisation with other African states to entrench nuclear-related norms in international relations. This socialisation includes scientific cooperation; the country's involvement in African organisations such as AFRA and the FRNBA; and its socialisation with African states at AU and NPT gatherings and at the UN, the Non-Aligned Movement (NAM) and the IAEA, where African states often meet to discuss common positions on particular nuclear-related issues. Despite the early positive indications of South Africa's niche diplomacy in Africa, the country's nuclear diplomacy faces several challenges. In the third instance, nuclear security on the continent remains a concern. For example, illicit nuclear trafficking and thus nuclear proliferation on the continent pre-dates the entry into force of the Pelindaba Treaty. The most notable cases are South Africa and Libya's previous development of nuclear weapons programmes. The implication is that these countries' nuclear facilities and material can still be used in proliferation activities. Since the signing of the Pelindaba Treaty some African countries were implicated in the nuclear proliferation network of the Pakistani AQ Khan.59 Since nuclear security in Africa continues to attract global attention, the IAEA and the US remain involved in the continent. However, in 2010, President Obama of the US invited only five African states to his Nuclear Security Summit (NSS). Broader African participation was required for Obama's second NSS held in Seoul, South Korea, in 2012 to strengthen nuclear security commitment in Africa if the continent intends to develop its peaceful nuclear programmes further without endangering its citizens. For South Africa as host and leader of AFCONE, the question of nuclear security will have to be addressed at continental level. In the fourth instance, South Africa faces the challenge of improving treaty compliance among African states. Africa's new sovereignty regime offers the continent the opportunity to hold African leaders and states accountable for their commitments to AU and AFCONE decisions.60 Notwithstanding this new regime, some African states are notorious for non-compliance with international agreements such as UNSC Resolution 1540 prohibiting states from providing support to non-state actors to acquire WMDs; and provides for the development and maintenance of measures and controls over WMDs, related materials and delivery systems.61 By 2008, only 19 African states had submitted reports, most of which were incomplete. All 53 AU-recognised states have either signed and ratified, or acceded to the NPT that came into force in 1970. Unlike their commitment to the NPT, African states' signature or ratification of the Pelindaba Treaty is less convincing. By January 2012, the AU confirmed that it logged 33 deposited ratifications and 51 signatories. Equatorial Guinea and Madagascar have still not signed the treaty, but both have ratified it. However, 20 of these signatory African states are yet to deposit their instruments of ratification with the AU as the treaty depository, indicating some progress.62 In this respect, South Africa could promote treaty compliance through instructive methods such as reminding states of their treaty-related interests and socialising states to adhere to the fundamental norm of international law to obey treaties, because non-compliance often results from ambiguities in the treaty, a lack of capacity to comply and time constraints. South Africa needs to pre-empt these issues in an appropriate manner. In the fifth instance, the Pelindaba Treaty does not prohibit the peaceful use of nuclear energy but requires that states promote "individually and collectively the use of nuclear science and technology for economic and social development". These provisions may pose some challenges to nuclear security. Several African states have already declared their intention to develop nuclear energy, including Algeria, Egypt, Ghana, Kenya, Libya, Morocco, Namibia, Nigeria, Senegal, Sudan, Tanzania, Tunisia and Uganda.63 South Africa has also indicated its intention to expand its existing nuclear energy facilities. Article 8 of the Pelindaba Treaty also requires states to "establish and strengthen mechanisms for cooperation". The treaty, therefore, provides states with the imperative to cooperate. However, increased competition among African states and foreign investors to gain access to Africa's nuclear market may compromise these provisions. In terms of verification, Article 9 makes it clear that all states who undertake activities for peaceful purposes shall conclude a Safeguards Agreement with the IAEA to verify compliance and shall not provide any material which may be used for the construction of a nuclear device. In the sixth instance, South Africa will be required to coordinate relations and cooperation between AFRA, the African Energy Commission (AFREC), the FNRBA and AFCONE. Established in 1990 by the IAEA and African states, AFRA predates AFCONE by more than two decades and has already achieved some successes.64 South Africa will have to address African states' entrenched interests in AFRA in order to establish an equal role for both organisations. With only twelve members, AFCONE is a much smaller organisation than the more influential AFRA which has 39 partnered African member states. This is more than the number of ratified members of the Pelindaba Treaty.65 The intended role of AFRA, which entered into force on 4 April 1990, may pose difficulties and cause it and other recently established atomic organisations such as the FNRBA to compete rather than complement AFCONE. This scenario may arise irrespective of whether both AFRA and IAEA officials have been elected as AFCONE commissioners. The Pelindaba Treaty intended that AFCONE should exert control over the development of nuclear projects on the continent and work closely with AFRA and the FNRBA to ensure greater security of radioactive materials. AFRA's purpose is to maximise the use of infrastructure and skills present in Africa and help countries to move towards self-sufficiency by using peaceful applications of nuclear techniques. The Pelindaba Treaty is unique as the only NWFZ with a strong "developmental focus" to address development in Africa.69 By working together (and with the IAEA) the AFCONE, the AFRA and the FNRBA are supposed to avoid redundant activities in order to strengthen Africa's commitments on disarmament and non-proliferation, and to find a balance between the needs of security and development in Africa. Finally, South Africa may face challenges posed by efforts to establish a Middle East Nuclear Weapon Free Zone. South Africa may be required to promote the establishment of a Middle East Nuclear Weapon Free Zone. To this end, South Africa has participated in the IAEA Forum on Experience of Possible Relevance to the Creation of a Nuclear Weapon-Free Zone in the Middle East in Vienna, Austria, from 21 to 22 November 2011. South Africa's hosting and leadership of AFCONE will also test the country's normative power. South Africa's maintenance of its normative power on nuclear non-proliferation on the continent and elsewhere is dependent on the legitimacy of the country's nuclear diplomacy. On its part, this legitimacy is dependent on the country's persuasive actions to promote nuclear non-proliferation on the continent and on AFCONE's activities. Persuasion involves constructive engagement and the institutionalisation of relations; the encouragement of multilateral dialogue is instructive in this respect.78 More importantly, South Africa's normative power will be determined by the impact and consequences of the country's socialisation of the norms espoused by AFCONE. The Pelindaba Treaty made an innovative contribution to the institutionalisation of NWFZs as functional regimes by providing for a mechanism of compliance through the establishment of a continental commission, AFCONE, with clearly defined tasks. Since 1990, South Africa has conducted its nuclear diplomacy with African states in such a manner as to convince the continent of its commitment to nuclear non-proliferation. By ascribing to the continental norm of a denuclearised Africa, South Africa constructed its identity accordingly to serve its national and international interests. Treaty only entered into force in 2009. One of the reasons for the delay was the pre-1989 South African government's unwillingness to join continental nuclear non-proliferation efforts. By the time continental efforts to resume negotiations on the ANWFZ treaty commenced in 1991, changes in South Africa's nuclear posture had changed. Initial continental negotiations on the treaty excluded South Africa. Once the IAEA verification process was completed, South Africa was invited to join the continental and international efforts to draft a treaty. Throughout this treaty-making process, South Africa's nuclear diplomacy followed two main strategies, namely cooperation and partnership. Its identity as a country with nuclear expertise and a former nuclear proliferator-turned-norm- complier resulted in the country being able to fulfil a particular role in these deliberations. Several diplomatic successes resulted from this. South Africa was endorsed as the host of AFCONE; it was elected to serve on AFCONE; and a South African was elected to lead AFCONE. Efforts to denuclearise Africa slowed down once the NPT entered into force in 1970. By 1990, political changes in South Africa included exposing the country's nuclear past. Once the continent accepted South Africa's nuclear non-proliferation commitments, it invited the country to deliberations on the ANWFZ treaty. This marked the beginning of South Africa's integration into African nuclear affairs. Subsequently, South Africa played a significant role in the final draft of the Pelindaba Treaty and was elected as the leader and host of the treaty's mechanism of compliance, namely AFCONE. South Africa's post-1990 nuclear diplomacy in Africa has undergone several changes. Most notably the country has ascribed to the continental norm of nuclear non-proliferation. It has acquired a niche role in nuclear diplomacy on the continent and has constructed a new identity as a state complying with the norm of nuclear non-proliferation as expressed through the continent's NWFZ. 1. B. Fourie et al, "Nuclear Matters: 'Bombs Away! '", in P. Wolvaardt, T. Wheeler and W Scholtz (compilers), From Verwoerd to Mandela: South African Diplomats Remember, Volume 3: Total Onslaught to Normalisation (Crink Publishing, Johannesburg, 2010), p 263. 2. Fourie et al, "Nuclear Matters", p 264. 3. United Nations, The United Nations and Apartheid, 1948-1994 (UN, New York, 1994). 5. W Epstein, "The Making of the Treaty of Tlatelolco", Journal of the History of International Law, 3, 2001, pp 153-179. 6. J.E. Okoloand and WE. Langley, "The Organisation of African Unity and Apartheid: Constraints on Resolutions", World Affairs, 137, 3, 1974, pp 206-232. 7. The Pelindaba Treaty is unique in that it is the only NWFZ treaty that established a compliance mechanism, namely AFCONE. 8. Epstein, "The Making of the Treaty of Tlatelolco", p 155. 9. K. Reddy, "The African Nuclear-Weapon-Free Zone Treaty (Pelindaba Treaty) and the Non-Proliferation of Nuclear Weapons", Journal of South African Law, 2, 1997, pp 273-286. 10. W Mukai, "The Importance of Nuclear Weapon Free Zones", Journal on Science and World Affairs, 1, 2, 2005, pp 79-86. 11. Mukai, "The Importance of Nuclear Weapon Free Zones", p 80. 12. J. Goldblat, "Nuclear-Weapon-Free Zones: A History and Assessment", The Non-Proliferation Review, Spring/Summer, 1997, pp 18-32. 13. The guidelines that were included in a consensus report of the UN Disarmament Commission of 1999 are that NWFZs should emanate exclusively from states in the region and be based on mutually agreed upon, legally binding arrangements by all states in the region; it should be recognised by extra-zonal states; NWS should be consulted prior to the ratification of the Nuclear Weapons Free Zone Treaty (NWFZT); state parties can decide on the access of nuclear aircraft, ships or submarines; the NWFZT should have a compliance mechanism; states have the right to develop and use nuclear energy for peaceful purposes; the obligations of the NWFZT should comply with international law; and international assistance, including UN assistance should be provided to states to establish a NWFZ. See Goldblat, "Nuclear-Weapon-Free-Zones", pp 54-55. 14. United Nations General Assembly, Final Document. Tenth Special Session of the United Nations General Assembly (UN, New York, 1978). 15. OAU, "Denuclearization of Africa, 1964", in O. Adeniji, The Treaty of Pelindaba on the African Nuclear-Weapon-Free Zone (UN Institute for Disarmament, Geneva, 2002). 16. UN General Assembly, "Resolution Adopted by the General Assembly on the Report of the First Committee: Non-proliferation of Nuclear Weapons", 1965, in Adeniji, The Treaty of Pelindaba. 17. OAU, "Draft Convention for the Denuclearization of the Continent of Africa, 1964", in Adeniji, The Treaty of Pelindaba. 18. S.C. Saxena, "Disarmament: The African Perspective", Strategic Analyses, 22, 7, 1998, pp 993-1017. 19. A. Oyebade, "African Security and Nuclear Weapons: Past Fears and Future Relevance", in A. Oyebade and A. Alao (eds), Africa after the Cold War. The Changing Perspectives on Security (African World Press, Trenton, 1998), p 97. 20. Adeniji, The Treaty of Pelindaba, p 50. 21. Adeniji, The Treaty of Pelindaba, p 53. 22. Adeniji, The Treaty of Pelindaba, pp 55-60. 23. The Group of Experts consisted of representatives from Algeria, Cameroon, Egypt, Ethiopia, Mauritius, Namibia, Nigeria, Senegal, Sudan, Togo, Zaire and Zimbabwe. 24. Adeniji, The Treaty of Pelindaba, p 58. 25. Oyebade, "African Security and Nuclear Weapons", pp 104-106. 26. F.W de Klerk, "Matters Relating to the Nuclear Non-Proliferation Treaty, Violence, Negotiation and the Death Penalty. Statement by the State President to a Joint Sitting of Parliament, 24 March 1993", Hansard, col. 3465- 3478. 27. K. Mackerdhuj, Towards a World Free of Nuclear Weapons: Why South Africa Gave up the Nuclear Option (UN Department for Disarmament Affairs, New York, 1997), p 7. 28. Adeniji, The Treaty of Pelindaba, p 61. 29. Adeniji, The Treaty of Pelindaba, p 62. 30. M. Muller, "South Africa Crisscrosses the Nuclear Threshold", in W Gutteridge (ed. ), South Africa's Defence and Security into the 21st Century (Dartmouth, Aldershot, 1996), p 39. 31. Adeniji, The Treaty of Pelindaba, pp 64-69. 32. Adeniji, The Treaty of Pelindaba, pp 71-155. 33. W Stumpf, "South Africa's Nuclear Weapons Programme: From Deterrence to Dismantlement", Arms Control Today, December 1995, pp 3-8. 34. Adeniji, The Treaty of Pelindaba, p 71. 35. The word 'Pelindaba' is derived from two Zulu words "pelile indabd' which means "the matter is settled" or "the discussion is closed". 36. Adeniji, The Treaty of Pelindaba, pp 154-155. 37. OAU, "The Cairo Declaration. Adopted on the Occasion of the Signature of the African Nuclear-Weapon-Free Zone Treaty (The Treaty of Pelindaba) on 11 April 1996", in Adeniji, The Treaty of Pelindaba. 38. African Union Peace and Security Council, Communiqué. 53rd Meeting, 31 May 2006. Available at http://www.ausitroom-psd.org/Documents/PSC2006/53rd/Communique/CommuniqueEng.pdf. Accessed 2 February 2012. 39. The Pelindaba Treaty includes a map of the ANWFZ extending across the entire continent and several islands, including Agalega Island, Bassas da India, the Canary Islands, Cape Verde, the Cardagos Carajos Shoals, the Chagos Archipelago (Diego Garcia), Comoros, Europa, Juan de Nova, Madagascar, Mauritius, Mayotte, Prince Edward and Marion Islands, Reunion, Rodrigues Island, São Tomé and Principe, Seychelles, Tomelin Island, and Zanzibar and Pemba Islands. 40. AU, Information Note on the African Nuclear-Weapon-Free Zone Treaty (Treaty of Pelindaba), Prepared for the 53rd meeting of the Peace and Security Council, 31 May 2006. Available at http://www.issafrica.org/uploads/53NOTE.PDF Accessed 2 February 2012. 42. R. Lamamra, Opening Address to the First Conference of State Parties to the African Nuclear Weapon-Free Zone Treaty (Treaty of Pelindaba), Addis Ababa, Ethiopia, 4 November 2010. Available at http://www.africa-union.org/root/au/index/index.htm. Accessed 4 November 2010. 43. Department of International Relations and Cooperation (DIRCO), Report on the First Conference of State Parties to the African Nuclear Weapon Free Zone Treaty (the Pelindaba Treaty), Addis Ababa, 4 November 2010. Unpublished document obtained from DIRCO. 44. DIRCO, Report on the First Conference of State Parties to the African Nuclear Weapon Free Zone Treaty (the Pelindaba Treaty), p 5. 45. AU, The First Ordinary Session of the African Commission on Nuclear Energy (ACNE), Concept Note, 2011. Available at: http://www.au.int. Accessed 4 May 2011. 46. The session was attended by representatives of member states and, as observers, representatives of AFRA, the IAEA, the CTBTO and the Forum of Nuclear Regulatory Bodies (FNBRA). Kenya, Libya and Togo, a quarter of the AFCONE's elected members, failed to attend the session. 47. AU, Information Note on the African Nuclear-Weapon-Free Zone Treaty (Treaty of Pelindaba), Prepared for the 53rd Meeting of the Peace and Security Council, 31 May 2006. Available at: http://www.issafrica.org/uploads/53NOTE. PDF. Accessed 2 February 2012. 48. DIRCO, Strategic Plan 2011-2014 (DIRCO, Pretoria, 2011), pp 29, 31. 49. AU, First Ordinary Session of the African Commission of Nuclear Energy (AFCONE): Conclusions. 4 May. Addis Ababa, Ethiopia. Available at http://www.keepandshare.com/doc/2844929/afcone-1st-ordinary-session-conclusions-en-pdf-june-1-2011-10-31-am-92k?da=y Accessed 24 April 2012. 50. O. Serrão and P. Bischoff, "Foreign Policy Ambiguity on the Part of an Emergent Middle Power: South African Foreign Policy through Other Lenses", Politikon, 36, 3, 2009, pp 363-380. 51. C. Landsberg, The Diplomacy of Transformation: South African Foreign Policy and Statecraft (Pan Macmillan, Johannesburg), pp 12-13. 52. A.K. Henrikson, "Niche Diplomacy in the World Public Arena: The Global 'Corners' of Canada and Norway", in J. Melissen (ed. ), The New Public Diplomacy: Soft Power in International Relations (Palgrave Macmillan, New York, 2005), pp 70-72. 53. Henrikson, "Niche Diplomacy in the World Public Arena", p 67. 54. Serrão and Bischoff, "Foreign Policy Ambiguity", p 370. 55. D. Lee, I. Taylor and P.D. Williams (eds), The New Multilateralism in South African Diplomacy (Palgrave Macmillan, New York, 2006). 56. J. Hamill, "South Africa in Africa: the Dilemmas of Multilateralism", in Lee, Taylor and Williams (eds), The New Multilateralism, p 119. 57. See, for example, C. Alden and M. Soko, "South Africa's Economic Relations with Africa: Hegemony and its Discontents", Journal of Modern African Studies, 43, 3, 2005, pp 367-392. 58. Daily Champion, "Minister Advocates Establishment of African Commission on Nuclear Energy", 19 September 2011. Available at http://allafrica.com/stories/printable/201109200188.html. Accessed 23 November 2011. 59. International Institute for Strategic Studies, Nuclear Black Markets: Pakistan, A.Q. Khan and the Rise of Proliferation Networks. A Net Assessment (IISS, London, 2007). 60. This sovereignty regime refers to the AU's departure from the OAU's position on the non-intervention in African states. See D. Geldenhuys, "Brothers as Keepers: Africa's New Sovereignty Regime", Strategic Review for Southern Africa, 28, 1, 2006, pp 1-29. 61. D. Dye, African Perspectives on Countering Weapons of Mass Destruction, ISS Paper no. 167 (ISS, Pretoria, 2008). 62. AU, List of Countries Which have Signed, Ratified/Acceded to the African Nuclear Weapon Free Zone Treaty (The Treaty of Pelindaba), 10 January 2012. Available at: http://www.au.int. Accessed 25 January 2012. 63. A.Z. Meshesha, Network Regulatory Bodies in Africa: Challenges and Opportunities, Presentation to an International Atomic Energy Agency (IAEA) Round-table Discussion on Nuclear Safety and Security Knowledge Networking. Vienna, Austria, 21 September 2011. Available at http://www.ansn.org/Common/topics/OpenTopic.aspx?ID =10834. Accessed 24 April 2012. 64. M. Edwerd, "Development of a Continent", International Atomic Energy Agency) Bulletin, 51, 1, 2009, pp 53-56. 65. In December 2011 AFRA's National Liaison Officers in Africa included Algeria, Angola, Burundi, Benin, Botswana, Burkina Faso, Cameroon, Central African Republic, Chad, Cote d'Ivoire, the DRC, Egypt, Eritrea, Ethiopia, Gabon, Ghana, Kenya, Lesotho, Libya, Madagascar, Malawi, Mali, Mauritania, Mauritius, Morocco, Mozambique, Namibia, Niger, Nigeria, Senegal, Seychelles, Sierra Leone, South Africa, Sudan, Tunisia, Uganda, Tanzania, Zambia and Zimbabwe. 66. International Atomic Energy Agency (IAEA), "Africa takes Nuclear Safety Stage", 2012. Available at http://www.iaea.org/newscenter/news/2009/africanucstage.html. Accessed 24 April 2012. 67. Meshesha, Network Regulatory Bodies in Africa. 68. According to Meshesha, Network Regulatory Bodies in Africa, these are Algeria, Angola, Botswana, Burkina Faso, Cameroon, Cote d'Ivoire, the DRC, Egypt, Ethiopia, Gabon, Ghana, Kenya, Libya, Madagascar, Malawi, Mali, Mauritania, Mauritius, Morocco, Mozambique, Namibia, Niger, Nigeria, Senegal, Seychelles, South Africa, Sudan, Tanzania, Tunisia, Uganda and Zimbabwe. 69. A. Minty, South African Statementfor the Meeting of the IAEA Technical Assistance and Cooperation Committee (TACC), 14 November 2011. Available at www.dirco.govza/vienna/speeches/TACC_2011_Minty_statement_20111114. pdf. Accessed 25 January 2011. 70. C. Harvey, "African NWFZ Treaty Enters into Force", Arms Control Today, September 2009. Available at: http://www.armscontrol.org/act/2009_09/NWFZ. Accessed 30 October 2009. 71. P.H. Sand, "Diego Garcia: A Thorn in the Side of Africa's Nuclear-Weapon-Free Zone", Bulletin of the Atomic Scientists, 8 October 2009. Available at: http://www.thebulletin.org. Accessed 20 October 2009. 72. P. Harris, "Not Just a Military Base: Reframing Diego Garcia and the Cha-gos Islands", African Affairs, 110, 440, 2011, pp 491^99. 73. AU, The African Union Commission Working toward the Early OperationaH^ation of the African Commission on Nuclear Energy, Press Release, 26 May 2011. Available at http://www.au.int. Accessed 25 January 2011. 74. G. Mukhatzhanova and M. Pomper, "Obama Seeks Senate OK for Protocols to Two Nuclear-Weapon-Free Zone Treaties", James Martin Center for Non-proliferation Studies, 2011. Available at: http://cns.miis.edu/stories/110506_obama_nwfz.htm. Accessed 25 January 2011. 75. A.E. Levite, "Never Say Never Again: Nuclear Reversal Revisited", International Security, 27, 3, 2003, pp 59-88. 76. Your Nuclear News, "MENA Nuclear Industry Announces over 0 billion of New Construction Projects at Annual Meeting", 6 September 2011. Available at http://www.yournuclearnews.com. Accessed 7 September 2011. 77. Levite, "Never say Never Again". 78. I. Manners, The Concept of Normative Power in World Politics, Danish Institute for International Studies (DIIS) Brief (DIIS, Copenhagen, 2009), p 3.